With his side sitting 15th in League 1, with five wins and 19 points to their name, Robbie Neilson has admitted he expected more. His side fought made to take an unlikely point last time out against Oldham, clawing back to 4-4 to draw at Stadium MK. The result keeps them within four points of the top six, but only adds to their 'sticky' run of late, picking up just two points from a possible 12 in October. 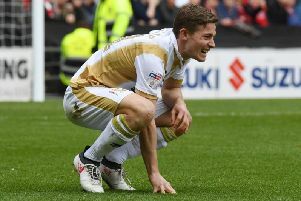 Setting out their stall to chase automatic promotion at the start of the season though, Dons are already 16 points adrift of Wigan Athletic in second, and 18 behind table toppers Shrewsbury. "We've not had a great start to the season," said Neilson. "We've been stop-start. We need to get back to winning ways. We went through a period where we were doing really well, but the last three or four have been sticky for us. "But with the injuries we've had, the errors we've made and the bad luck we've had, we hope we're through it and can start to build some momentum. "It's still very tight at the moment. If you pick up two or three wins, we'll be in the play-offs and we can kick on from there." While Neilson considers the draw with Oldham to be two points dropped rather than one gained, the manager still believes there are positives to take from the game, in particular his side's spirit in battling back from two goals down. He said: "You never want to be in that situation but thankfully everyone, including the crowd, responded. It shows our spirit, how we all want to do well - you could see that from our celebrations when he got level. We even had a few chances after that too, we weren't happy with just a point. There are lots of positives to take."